As It Is have wasted no time kicking off 2019. The band is premiered their new music video for “The Fire, The Dark” exclusively with PopCrushand Loudwire. The video shows footage from the band’s recent headlining UK/EU Tour and is a special “welcome” to Guitarist Ron Ish, who was announcedJanuary 17, 2019 as an official member of As It Is. Fans can check out the music video and full feature at found.ee/thefirethedark. “The Fire, The Dark” is the latest single from the band’s recent release "The Great Depression." Released via Fearless Records last Fall, this album is comfortably As It Is’ most layered, technically accomplished and certainly most aggressive release to date. 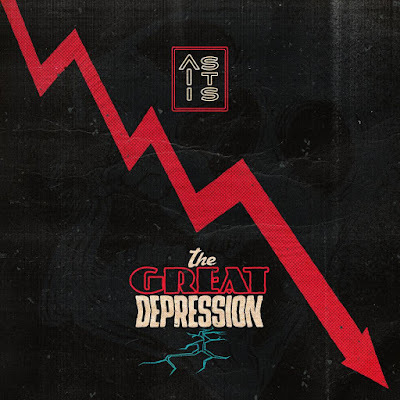 "The Great Depression" was produced by legendary producer MACHINE (Lamb Of God, Every Time I Die) and is a record that establishes the band as one of the most daring creative forces in their scene. Music videos for “The Wounded World,” “The Stigma” and “The Reaper” further prove the creative and storytelling power of the Brighton-based quartet. The band kicked off "The Great Depression Tour: Act II" in Los Angeles, California. Fans were able to tune into PopCrush’s Instagram Story throughout the day for a behind the scenes look into the first day of tour. Tickets and VIP packages for all dates are available at asitisofficial.com. With support from Sharptooth, Hold Close and Point North, this tour is in partnership with A Voice for the Innocent, a non-profit organization that provides community, resources, and support for people who have been affected by sexual violence. They will have a representative at every date of the tour to educate fans and act as a resource for anyone that may need their assistance. As It Is continues to encourage fans and the larger music community to not only speak up, but to also listen. From public perception, to internal war, the band unflinchingly confronts the most difficult questions around depression, the value of life over death, and whether the rhetoric around ‘reaching out to talk’ is ostensibly hollow, if no one is prepared to hear those words. "The Great Depression" is available to stream and purchase at asitisofficial.com/. As It Is is Patty Walters (Vocals), Benjamin Biss (Vocals, Guitar), Patrick Foley (Drums), Alistair Testo (Bass) and Ron Ish (Guitar).